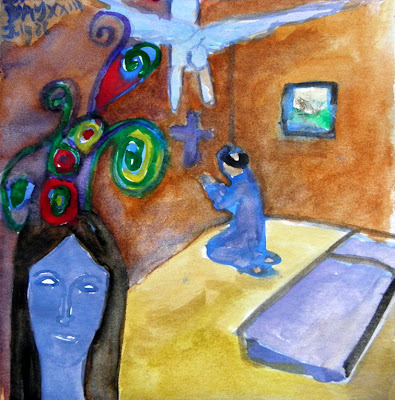 In this piece, I imagine myself as an Italian monk in a little cell. All I have is a simple cot, a wooden crucifix, prayer beads and perhaps a bowl. A garden can be seen out the window. I spend my days praying, cleaning, gardening and doing service in the community. In this scene I pray to the cross and an angel drops down: she hears my prayers. In the bottom left corner is myself at the moment, a female with long, dark hair. The swirls and colors coming out of my head indicate that I am dreaming...the colors form the dream of this time before memory.